“By 1972, popular music had once again been swept by change. As the optimism of the Sixties faded, black music reflecting the changing dynamics of America’s inner cities began to dominate the scene. In 1971, Sly & The Family Stone’s There’s A Riot Going On broke through, while Marvin Gaye’s album What’s Going On produced a huge hit single of the same name. A year later, Stevie Wonder’s coming of age put Music of My Mind and Talking Book into the lists of million sellers, with “Living for the City” from 1973’s Innervisions chiming with the realities of black urban life. Freedom? Synthesisers? Both would have resonance in his 1972 album Crossings, the beginning of a new direction in Hancock’s music. After leaving Miles Davis in 1969, he had formed his own sextet, a group that he managed to keep together at a time when jazz had all but been swept aside by the sudden and unexpected rise of rock music of the Sixties. Overnight, he had seen jazz clubs either closing their doors or changing themselves into things called Discotheques while more and more American jazz artists sought security of work in Europe. Those who remained at home were forced to reassess their artistic direction along the lines of socio-economic reality. 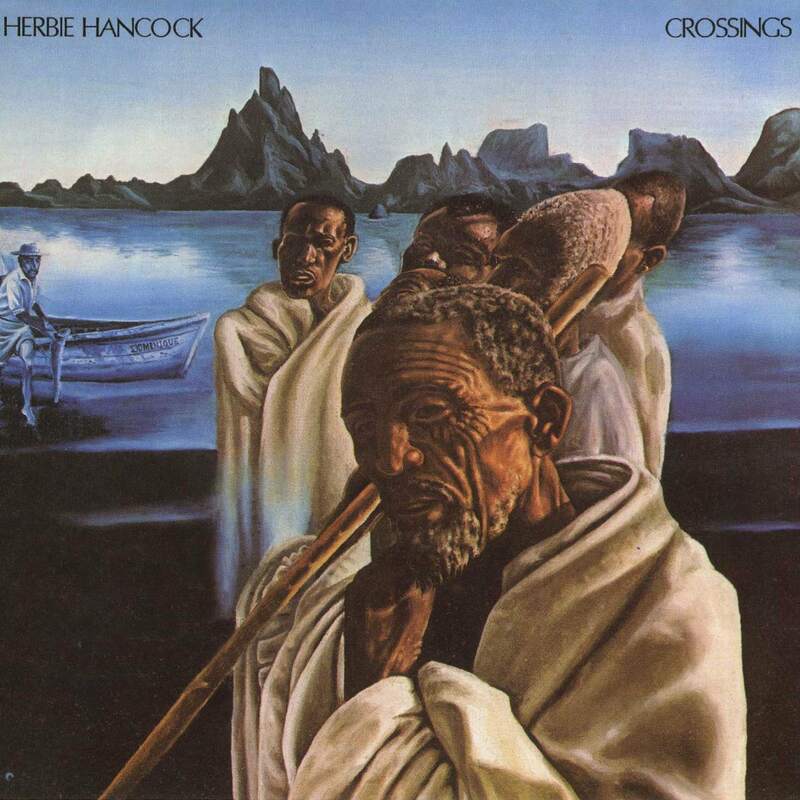 In February 1972, Hancock and his group entered Pacific Recording Studios in San Mateo, California to make Crossings. Rubinson suggested that Pat Gleeson come in and set up his Moog synthesiser for Hancock to play. “Electronics was associated with rock n’ roll at the time. The synthesisers, just the sound of the stuff,” said Hancock. “And so we felt like if we could do anything that could link us somehow to a wider audience, as weird as the music was, it could possibly help sales.” Although sceptical at first, Hancock was quite taken by the synthesiser and asked Gleason not only to do the overdubs on his album but join the group, making it one of the first groups to take a synthesiser out on the road. The experiential approach was carried further on the 1972 recording Crossings, which introduced the group’s seventh member, Patrick Gleason on Moog synthesizer, plus conga drummer Victor Pontoja and a five-voice chorus. “Sleeping Giant,” a particularly ambitious Hancock composition, touches on several moods and textures as well as the added players and the expanded arsenals of the sextet regulars. Everyone except Gleason is playing percussion on the opening, which carries a strong African flavor that reinforced the album’s striking Robert Springett cover painting. Hancock and Williams toy with the meter before establishing a forceful 6/8 that the pair ride into a magnificent extended improvisation. As in “Ostinato,” the steady pattern frees Hancock for some striking rhythmic superimpositions, while also allowing a heady momentum to build. Hancock sounds a phrase to signal a change in mood, and the horns return with slowly congealing parts that make effective use of muted trumpet against a deep trombone bottom. Williams emerges with an odd, halting pattern on electric bass that supports Priester’s echo-laden meditations as Hancock and Hart grow more active, finally taking the music into a funky 13-beat vamp for the rhythm section. The quieter theme reappears just as suddenly, then gives way to a steadier, more symmetrical passage where Hancock again blows over charged backing from Williams and the others. His percussive approach prevails until he sounds the cue riff once again to bring the horns back for more thematic musings. Now Maupin takes over, with Williams and occasional percussion in support, until the other horns and the funk tempo returns. Linear development and pure sound are both used effectively in Maupin’s soprano sax solo, with sympathetic comping from Hancock that helps build the tension. Then the other horns are cued back in and the music seems headed for a peaceful conclusion; but the giant, far from exhausted, gives one final kick before the band closes with a passage where sound turns to pure air. Chords from an acoustic piano trigger “Quasar,” the first of two Maupin compositions that complete the Crossings session. Built around a simple unison theme and a 7/4 time signature, the piece takes on a fluid, other-worldly coloration with Gleason’s synthesizer washes and the composer’s peripatetic alto flute. Henderson follows with one of his active, probing episodes as a cowbell reinforces the beat. The ending is effectively ominous-lost sounds in uncharted space. Maupin’s other contribution, “Water Torture,” makes even greater use of Gleason’s presence. It begins with strange sonic drips and disembodied voices, the drum and percussion parts offering the anchors of stability in this strange new world until electric piano and bass clarinet state the slinking theme that could pass for one of Hancock’s own. What follows is not so much a solo as a collective impressionist sound-painting, with everyone applying dabs of color to the constantly reconfigured canvas. The melody reappears to signal new rounds of invention, with Henderson often hovering at the top of the sound mass and Gleason supplying ever more impetuous colors.